Taste test: The taste testers at the Network World Chip of the Day location really enjoyed these chips, they got gobbled up pretty quickly. 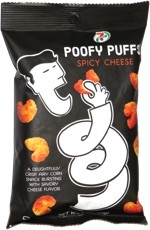 I thought they were a bit more salty than normal, and it's a spicy barbecue taste, not a sweet or mesquite style. It had lots of flavoring powder on them, and they were slightly greasy. I guess if you like Memphis-style, these chips will be good for you. Smell test: A different type of BBQ smell, not as sweet as other chips, but still distinctly a barbecue smell. From the package: “The BBQ taste that was voted #1 in Memphis is now on a potato chip. The famous balance of flavor and spices in Corky's Original Bar-B-Q Sauce was added to America's favorite snack, potato chips. 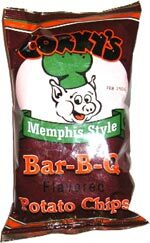 The capital city of barbecue has added another chapter in its long history of outstanding BBQ flavors by capturing the mouth watering Corky's Memphis Style BBQ Flavor on a chip. Company: Husman Snack Foods Co.
Trivia: Also look for Corky's BBQ Sauce in your local supermarket. This snack was discovered by Ann at Opryland Hotel, Nashville, Tenn.. Review published .